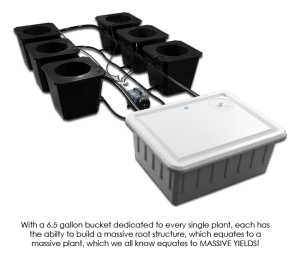 This is the best hydroponic recirculating deep water culture system on the market today. It is available as 6, 12 or 24 bucket systems. These are made right here in the USA and are not cheap imports. They are made in California by SuperCloset, a vendor you can trust with an A+ rating from the Better Business Bureau. They offer a 3 year warranty and lifetime customer support. There really is no other system like this. The circulation in these bubble buckets is like a root jacuzzi and it eliminates the fluctuations in pH and nutrient levels that plague cheaper bubble bucket systems. Watch the video below to see how the SuperPonics BubbleFlow Buckets work. 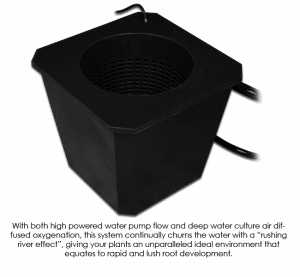 The BubbleFlow bucket system combines bottom flow technology with recirculating deep water culture for individual buckets connected to one or two reservoirs(for the 24 pack). It provides a highly oxygenated nutrient delivery system. Water changes are easy and the whole system is low maintenance. 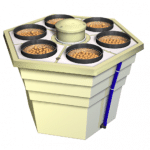 The buckets hold 6.5 gallons each for larger root systems, bigger plants, and higher yields. Your crops will mature faster too. Current price for the 6 bucket system is about $500 with free discrete shipping. Prices may go up or down so click the link for the latest prices. Financing is available through PayPal’s Bill Me Later program too.